ThinkGeek – the same company that brought us the JOYSTICK-IT and the iCade iPad cabinet, comes another impressive device designed with mobile gaming in mind. It is called the iCade 8-bitty and looks quite similar to those of classic NES game controllers with its boxy looks and button arrangement. It is a retro-styled wireless controller, made to work with the iPhone, the iPad, and Android smartphones or tablets. It comes with a total of 8 physical buttons – four action buttons up front, a select and start button, and two shoulder buttons, along with a 4-way directional pad. There are hundreds of classic video games that are compatible with the accessory, including the Atari Classics collection, Pac-Man, Super Mega Worm, and many more. This will enable all the users to witness the newest experience of retro-gaming action just by fitting in a pair of AAA sized batteries. The controller is now shipping from ThinkGeek for $29.99. 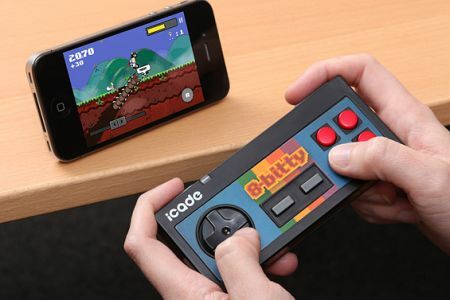 0 Respones to "ThinkGeek's 8-bitty game controller for iPhone and Android devices"